Audio & Cinema em Casa started in 1989 under the title Audio, and today is the premier Portuguese magazine concerned with audio and video. It has been the market leader almost since its first appearance. The magazine covers a very wide range of products and technologies including, home cinema, car audio, and computer products. Its monthly coverage includes technical articles about evolving trends and technologies connected with audio and video, plus interviews with prominent representatives of the industry. Audio & Cinema em Casa also organises the Lisbon Audioshow, now in its 29th year, and the largest exhibition of consumer electronics in Portugal. Starting now its 30 th year of publication, Audio & Cinema em Casa continues to follow all the new developments, technologies and formats in the audio and video fields. 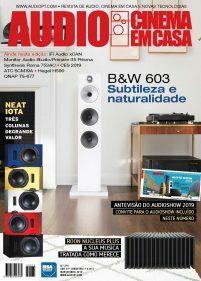 Audio & Cinema em Casa is a magazine dedicated to testing, promoting and showcasing consumer audio and video equipment to a broad range of readers, including professionals from most companies selling audio and video equipment in Portugal. "Audio & Cinema em Casa has been a member of EISA since 1994. The main reason behind our membership is about being engaged with a very professional organisation that has much prestige within the consumer electronics industry and it was an honour for Jorge Gonçalves to have fulfilled the duties of EISA president for almost 15 years. EISA opens doors for our magazine, creating a direct link to people that really count in the industry. And the latest products are available to EISA magazines a long time before other publications. This is a tremendous asset that enables our readers to be sure that they have access to all the news, products and technologies long before everyone else."